Wednesday April 6 1910 I was busy with the work all forenoon. Had early dinner to Will went to town at 12.12. I went an hour later and Will had a picture taken. I went the M E Church to the funeral of Myer Hiram Love. I afterwards met his son Albert. 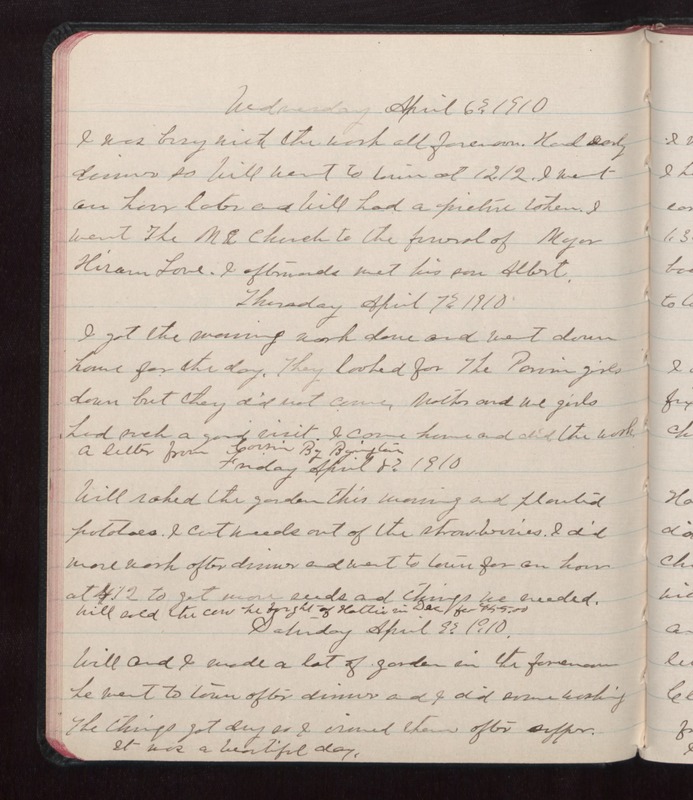 Thursday April 7 1910 I got the morning work done and went down home for the day. They looked for the [illegible] girls down but they did not come. Mother and we girls had such a good visit. I came home and did the work. A letter from cousin By Byington Friday April 8 1910 Will raked the garden this morning and planted potatoes. I cut weeds out of the strawberries. I did more work after dinner and went to town for an hour at 4.12 to get more seeds and things we needed. Will sold the cow he bought of Hattie in Dec for $55.00 Saturday April 9 1910. Will and I made a lot of garden in the forenoon he went to town after dinner and I did some washing the things got dry as I ironed them after supper. It was a beautiful day.